Three things I've done that you may not have done. 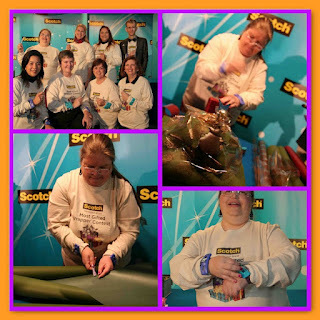 I went to New York City as one of eight finalists in the 2008 Scotch Brand Most Gifted (Gift) Wrapper Contest. According to the public relations firm that handles this extravaganza every December for 3M/Scotch, I am still ranked eighth in the nation. I didn't win that year, but the trip itself was prize enough. I was born with the spelling gene. Back in the day, you could only compete in the Scripps-Howard National Spelling Bee up until you were in the sixth grade or so (or else that is when the Plano ISD cut off the preliminary rounds and sent us into full adolescent screech mode.) I competed in fifth and sixth grades and went to the state level both years. The first year I missed the word "pursuant" (I had an "e" instead of the "u," thinking of "per-" words). The second year I was panicking because my dad, who had just recovered from a massive heart attack (and this was just before the bypass became commonly used, so he was considered extremely fragile), clutched his chest and left the TV studio just before I was up to spell. I misspelled "affiliated" (I doubled the "L"), probably because I had watched so many TV ads for Affiliated Food Stores and had double vision. I was almost relieved to be able to leave the line and go see what had happened to my dad. (The spelldowns were the only time he really took any interest in me as a preteen.) It turned out that he'd been too nervous to watch and had gone outside for a smoke. Yes, sports fans, he still smoked and they weren't making people quit back in the day. No, REALLY. I wish I had a photo of the bee. Before digital cameras, everyone was all worried about "wasting film" and cameras were big and bulky with huge hot flashbulbs and we simply don't have photos of the significant events in our lives the way y'all have now. It isn't fair. I demand a do-over. Here I am with my dad at Christmas in my fifth-grade year. We hadn't done the Bee yet, but we would begin studying "Words of the Champions" the following spring. Ah, for that sweatshirt now! And "Dancerina," my big present. She came with a cardboard record with selections from the "Nutcracker Suite." 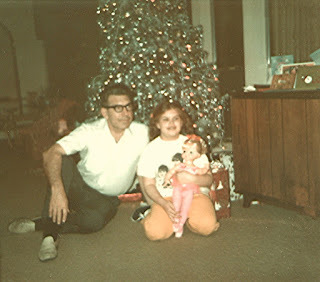 The record and the doll were given to one of my young cousins as soon as my mother decided I was too old to have dolls. So it goes. And now I've forgotten the third thing. Oh, yeah, my CD. "Mixtape" by Shalanna Collins. It was only produced in extremely small test quantities (I burned a couple of copies for the van), and I discovered that it needs to be remastered in some type of listenable way. Eventually, I'll get around to re-recording the songs and making it sound good. Tracks include three of the pieces that my heroine Paige in LOVE IS THE BRIDGE wrote and performed in the novel. I really like the CD cover, too. It will be a while before I get time to work on that, though. What will I do with the Paige tracks in the meantime? When LOVE IS THE BRIDGE sells and gets into print, I plan to offer them as free MP3 downloads to all purchasers. Or maybe just anybody. Haven't decided yet. What have you done that other people haven't?